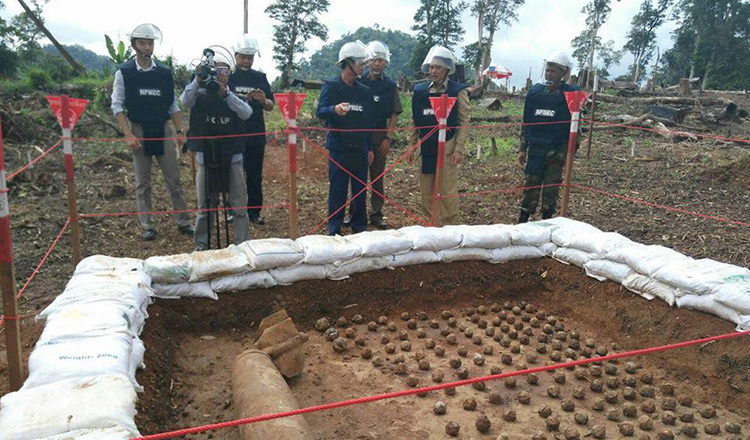 The presence of unexploded ordinances around the country is a violent reminder of wars waged decades ago on Cambodian soil. After 25 years of clearing minefields, various organisations tasked with demining the country have successfully cleared 1,036,376 anti-personnel mines, 24,251 anti-tank mines, and 2,660,638 of other types of explosives. The number of casualties dropped from 4,320 in 1996 to about 100 per year over the last five years. 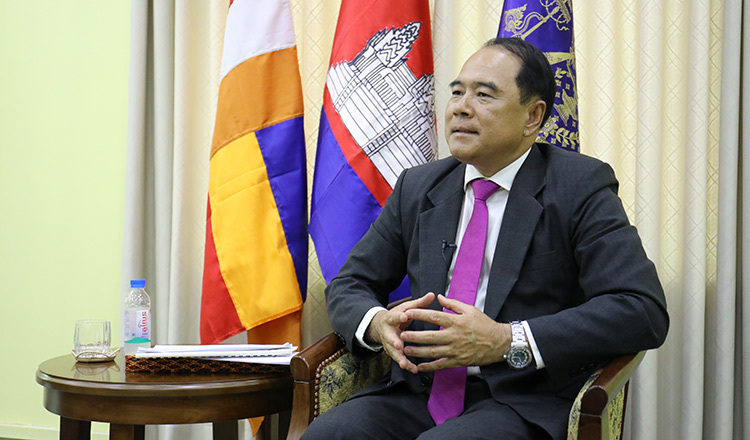 Ly Thuch, senior minister and the vice president of the Cambodian Mine Action and Victim Assistance Authority, speaks with reporter May Titthara regarding the roadmap to make Cambodia mine-free by 2025 as the National Mine Action Conference begins today. KT: CMAA started demining operations in 1992. Here we are decades later, what are the hallmarks of your achievements? Ly Thuch: Over the past 25 years, under the leadership of the current administration, CMAA cleared more than 1,700 square kilometres of land since we first started in 1992. These were lands heavily contaminated by explosives left over from the war. We were able to turn it from a deadly minefield to productive lands able to provide income through agriculture and cultivation. We destroyed 1.1 million anti-personnel mines, 24 thousand anti-tank mines and we identified 2.7 million explosive remnants of war (ERW). So this is an achievement, because it was historical that CMAA members were able to do this. Cambodia is also grateful to our generous donors from 20 countries who became our development partners. I can say for sure that we can reduce explosives-contaminated land over the next few years and clear our land for our people – our rural people in the villages and in the remote areas. KT: The goal of CMAA is for a mine-free Cambodia by 2025, and that’s less than seven years away. At the rate that mines are being cleared, how close are you in achieving that goal? Ly Thuch: The problem started back during the Vietnam War and then we had our own internal conflict that lasted three decades, this has made Cambodia one of the most contaminated countries in the world. It has been estimated that there are still millions of ERW in our country and this is a monumental task for CMAA. We have been successful in clearing hundreds of square kilometres per year. 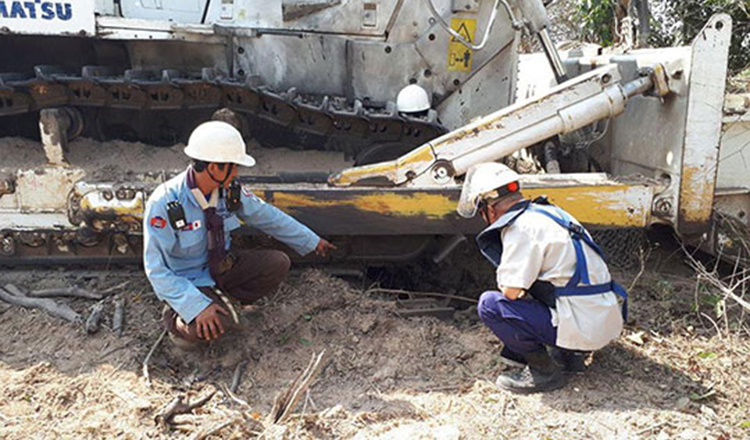 In order to achieve our goal of a mine-free Cambodia, it is imperative that we increase our capacity to clear more land in the future. KT: There are minefields scattered across the country, making it risky for a lot of people to conduct their day to day activities. Which areas are the most challenging when it comes to demining? Ly Thuch: We categorised the areas into two types of locations. 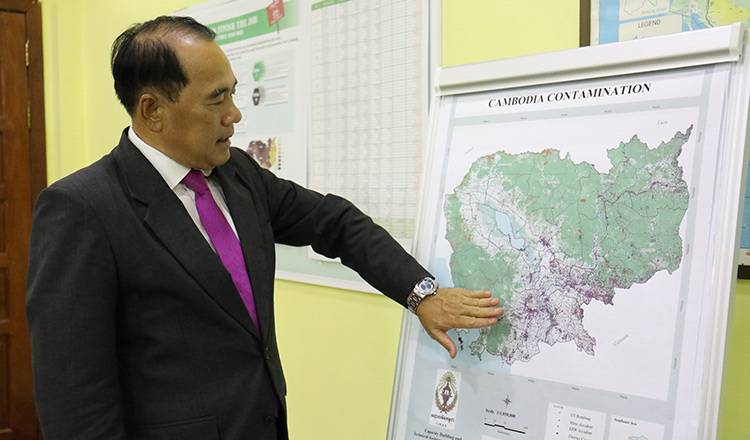 The first are the most contaminated areas along the Thai border that was left over from our internal conflicts – these areas are the most deadly. Then we have the eastern part of our country, the northern parts of the country, in Mondulkiri, Ratanakiri, Kratie and Stung Treng. There, cluster bombs were dropped by the US during the Vietnam War in the 60s. 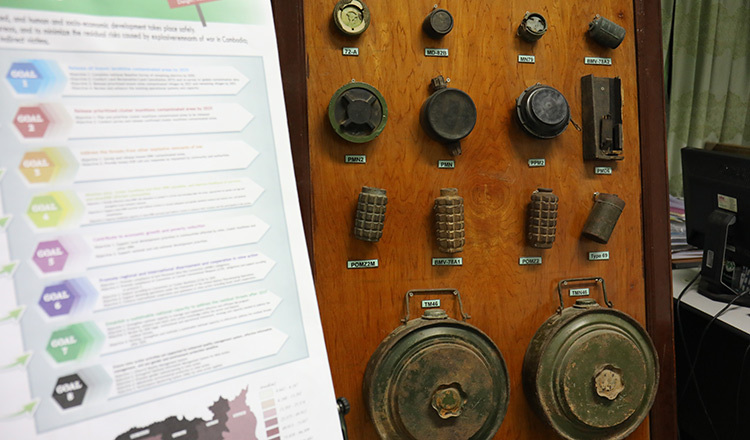 It is a challenging task to locate every single explosive because even in Phnom Penh, there was the Khmer Rouge conflict that also contributed to the problem. There are mines almost everywhere, more or less. However, the least contaminated provinces are Battambang, Preah Vihear, Banteay Meanchey and Oddar Meanchey. KT: What sort of technical problems do deminers face in the field? Ly Thuch: Our deminders working in the field face many challenges. As you know, the terrain in Cambodia is very diverse – we have hills and our land is mountainous. Second, we have the forests and vegetation that grow quickly. And finally, seasons change drastically here so it disrupts how we track mines because it is often affected by water flow and erosion. So our deminers – our heroes – they work very hard, they risk their lives by facing these challenges. Recently, one of our heroes was killed when a mine exploded as he was digging for it buried beneath a tree. The problem is that we don’t know where the mines are – they were planted everywhere – we don’t know where, we don’t have a map, and we don’t have anything to assist us. It’s a challenging mission for our 4,000 deminers across the country. KT: What about the challenges for CMAA officials? Ly Thuch: We learned so much over the past 25 years and experience developed our capacity building skills. The CMAA has become more professional. So, first we still need to continuously upgrade the skills of our deminers in the field and the supporting staff in order to make our work more efficient, more effective and spend less money for more results. The second challenge lies in the lack of human resources. Our miners are old now and some of them had to retire. What we are doing now is motivating a younger generation of deminers to come and continue performing this monumental task. Another challenge is funding. Demining is very costly, we need support not only from the government, but also from our friends in the international community, our development partners, to support our efforts. In doing so, people living in rural areas will be able to live safely because we also aim to reduce poverty. Clearing a piece of land means more income for the poor. Once the land has been cleared, they can produce agricultural products. We still have to clear over 1,900 square kilometres of contaminated land. The number is staggering because the population continues to grow and people migrate more and more into the forests. To clear that amount, we need roughly around $400 million. We need that money to be able to meet our 2025 target. When I say mine-free by 2025, I mean free from anti-tank and anti-personnel mines, not other ordinances. If we want to be free from all unexploded ordnances, we will need to clear at least 1,000 square kilometres per year. Additionally, we will need $190 million for that. And the second issue is the cluster bombs dropped by the US in our country. On behalf of the government, I urge the US to continue to support demining in the northern parts of the country because 2.7 million tonnes were dropped there and we need them to be accountable for what transpired. KT: Deminers clear the land so that it can be used for agriculture by villagers. However, it’s a dangerous job and there have been casualties. What benefit is there in the work for deminers? Ly Thuch: Deminers are the backbone of our work. We cannot work without them. We don’t have heavy machinery to destroy landmines, so we use people. They are our heroes – they risk their lives every minute of every day. They have been successful so far and we have around 4,000 of them. Unfortunately, some have died in technical accidents or other forms of demining accidents. To help support their lives, Prime Minister Hun Sen announced that deminers now have access to free healthcare nationwide. Some of them are old now and we need to replace them with younger ones. We need to continue to train them and continuously update the safety measures. This is how we help. KT: Can you tell us how many people are affected by mines each year? Ly Thuch: Cambodia ranks among the highest in the world in terms of how many are disabled. This is the legacy of war. Speaking about this, in 1996, 4,000 have died because of this but we managed to reduce the number to 53, as we cleared more minefields. A lot of this is credited to mine education – because of our operators, NGOs and other supporting organisations like the Red Cross. They help educate people on the ground, students at schools, villagers, and other communities. We teach people on the dangers of landmines and we are improving the reduction of the number of mine-related deaths. Every year, we continue to spread awareness and encourage the public to work on mine-education. 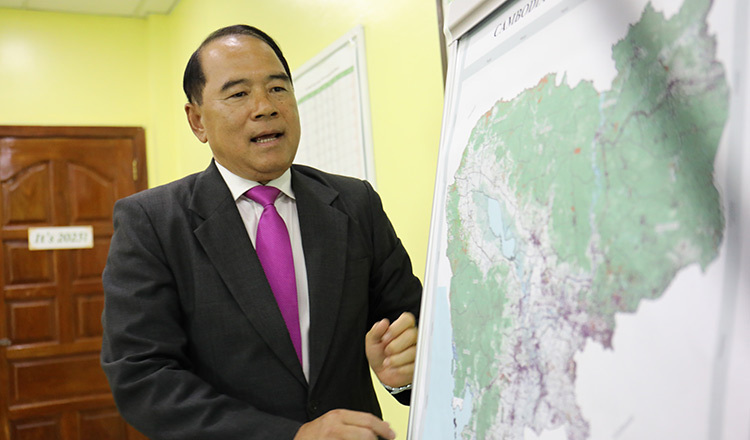 KT: The aim is for a mine-free Cambodia by 2025, what needs to be done to achieve that goal? Ly Thuch: Our focus is on clearing landmines including both anti-tank and anti-personnel mines – we know where they are. There are around 946 square kilometres and we need around $190 million to address it. Second, we need to work on over 600 square kilometres of land contaminated by cluster ammunition. Additionally, we need $120 million to clear other explosive remnants. Finally, we need over half of a million dollars to survey areas and collect more field data. The last survey we did was more than a decade ago. Some of the land became agriculture land. Our logic is if farmers can farm for three or four seasons without casualties, then we can declare that that area is mine free. So, this is what we are planning to do from now to 2025 for Cambodia to be mine free, so it means that anti-personnel and anti-tank mines are gone or destroyed in our country. That is our target and mission. To achieve that, we need anybody to join us, the government, our Prime Minister. CMAA would like to thank the Prime Minister, the government and also our international partners. Thank you to our operators – our heroes – those who are doing a wonderful job for our country.